Funeral services are scheduled for 10 a.m. Friday, Oct. 13, at First Baptist Church for Raul B. Baeza of Artesia. 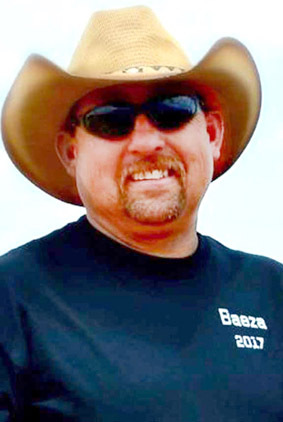 Baeza, 46, passed away Friday, Oct. 6, 2017, at University Medical Center in El Paso, Texas. Pastor Abel Belanos will officiate the services, with interment to follow at Woodbine Cemetery. Pallbearers will be Pedro Baeza, Joel Baeza, Efren Baeza Jr., Benny Baeza, Daniel Cerna, Adrian Munoz, Michael Munoz and Lorenzo Munoz. Honorary pallbearers are Rosa and Danny Samora, Bobby Baeza, Gilbert Baeza and Pilar Becerra. Visitation will begin at noon Thursday at Terpening & Son Mortuary. Raul was born Sept. 25, 1971, in Artesia to Efren S. and Maria (Becerra) Baeza. He was a lifelong Artesia resident. On July 20, 1990, he married Delilah Cerna in Carlsbad. Raul provided for his family by driving trucks. He enjoyed watching bull riding, hunting and mud-bogging. His love was his family and getting to spend time with them. Survivors include his wife, Delilah, of the family home; son Chris Baeza of Artesia; daughter Vianka Baeza of Artesia; parents Efren and Maria Baeza of Artesia; sister Rosa Samora and husband Danny of Placitas; brothers Joel Baeza and wife Christine of Artesia, Pedro Baeza and wife Laura of Ft. Worth, Texas, and Efren Baeza Jr. and wife Maria of Artesia; mother-in-law Trini Scheuerman and husband Donny of Carlsbad; sister-in-law Tanyah Baeza and husband Gilbert of Carlsbad; brothers-in-law Daniel Cerna and wife Denise of Carlsbad and Israel Cabezuela and wife Alejandra of Hobbs; and grandchildren Cristoval R. Baeza, Analiyah N. Baeza and Arryah R. Baeza.